This week on Facebook and also on my email newsletter I asked you all what your biggest frustrations were in your home. My “job” here as a blogger is to serve you and I wanted to know what you needed help with. 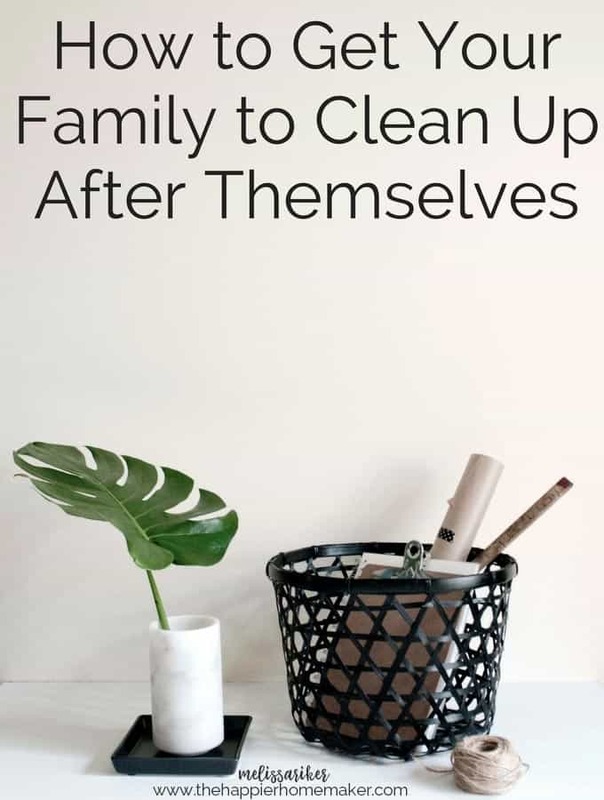 By far the most common response was how to get your family to clean up after themselves. This is a daily battle at my home too so today I’m going to offer some tips and tricks for you. If your partner isn’t already in the habit of picking up after himself/herself I suggest starting with them first. You need to be on the same page before tackling the kids. Find a time to talk and tell them how you feel-don’t make it a power struggle or a nagging session. Explain that picking up after them cause you stress and makes you feel resentful. Be specific with what you’d like from them-do you want him to make sure to put his dirty clothes in the hamper? Can the hamper be moved to a place that’s more convenient? Listen to their feedback and ask them to help you find solutions-work together. Sometimes it helps to give the less organized person a specific “messy” area like an office or dresser top where they can keep things without worrying about being organized. In our family I’m the messier one by nature and I work best when I have a space that I can not worry about keeping presentable, like an office or corner of the closet. Finally, if you don’t get any headway with your spouse consider hiring help. Get rid of your cable TV, go out to eat less, make a sacrifice to work it into your budget. Your spouse may see how important it is to you and make more of an effort once the bank account is involved. Once you’ve got your spouse on board have a family meeting with your children. Re-establish family rules-I suggest giving them one warning to pick up their things and after that they lose the item for an amount of time. The most important part of this process is to follow through! If you don’t back up the rules the behavior will never change. I repeat: DO NOT CLEAN UP AFTER THEM. Every time you clean up after them instead of requiring them to do it themselves you are showing them it isn’t their responsibility to help with the cleaning. When tidying with younger children it helps to be specific. Very young kids can’t look at a big messy room and see the steps they need to take to get it clean-it’s overwhelming. Give specific directions. Instead of saying “clean the mess” tell them to to pick up all the stuffed animals, or clear the toys off the couch. Especially with younger children, making clean up fun is important. Sing songs or play music-even I do this when cleaning by myself sometimes! My three sons love when I give them time challenges to clean a room-it makes it a game to race to finish the job! Model good habits and expect the family to follow. Clean up after yourself and hold others to the same standard. It’s a good idea to have a family clean up time-a quick 15 minute tidy up after dinner can go lightyears towards keeping your home clean. When I was growing up being raised by a single mother we always spent Saturday mornings cleaning the house. Get the entire family involved in the process before moving on to other activities. Don’t expect change to happen over night, it will be a process. Have weekly meetings to check in on the rules, be consistent, and keep your expectations high (with a good dose of grace!) Over time your family can learn to work together to maintain a happy, tidy home. Left it too late as it was easier to pick up after the spouse! Now we are both retired and he is too old to teach, he just pretends he does not hear! The worst evil he does is use a wooden cutting board and if it is dirty turns it around and uses the clean side, in the meantime dirtying the bench! Nothing gets me more mad, hahahaha! But I did the dishes and cleaned everything except the space he dirtied, two days later and its gone, hahahaha, took a lot of strength to leave it there! These are great tips! I started early with giving my kids chores and some people laughed when I had my two year old sorting laundry. We practiced learning our colors that way. :-). I figured out she really liked putting spray and wash on things so I let her look for stains and go for it! She is 7 and she can practically do her own laundry (although I secretly cringe seeing how she folds some things). I love your suggestions for making it fun. I tell jokes and sing silly songs to both kids sometimes or we make it a race. I agree, children should be thought to do chores from an early age, otherwise they will grow up expecting us to do everythign for them. Keeping a home clean is a full-time job and everyone should take part in it. Nowadays everyone works and has limited free time, but this doesn’t mean that we can’t take a good care of the place we live in too. Some excellent advice here thanks Melissa. Getting everyone on board is so important to this process. Once the family feels like a community contributing together there is far more desire to help out. Melissa, I am glad that you focused on the responsibility of all the family members, Definitely if a family member doesn’t completes his/her work then the other member will have a bad time so its the responsibility to teach them to do the work themselves. I know that the cleaning work is definitely the hardest part to teach.